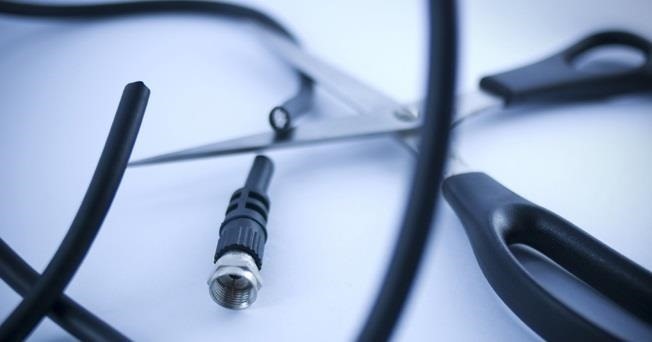 If you've recently joined the ever-growing ranks of the cable cutters, you're far from alone. More and more people (myself included) are getting fed up with service providers' outdated subscription models and absurd pricing—and canceling their service. There are more legal alternatives than ever, and if you're willing to wait a little longer to catch up on your favorite shows, you can save a ton of money. In addition to online services like Netflix, Hulu, and Crackle, you can still watch some over-the-air channels like ABC , NBC, FOX, and PBS free of charge, but you have to be able to pick them up. There are plenty of antennas you can buy to help boost your signal strength, but few of them are as effective as the Gray-Hoverman antenna. Invented and first patented by engineer Doyt R. Hoverman in 1959, the device is called a "super antenna" because it greatly increases the range and number of channels you can pick up. Users are commonly able to tune in to stations broadcasting 30-40 miles away, and sometimes more. Both of the two patents on the device have since expired, making it easier than ever to build your own at home. 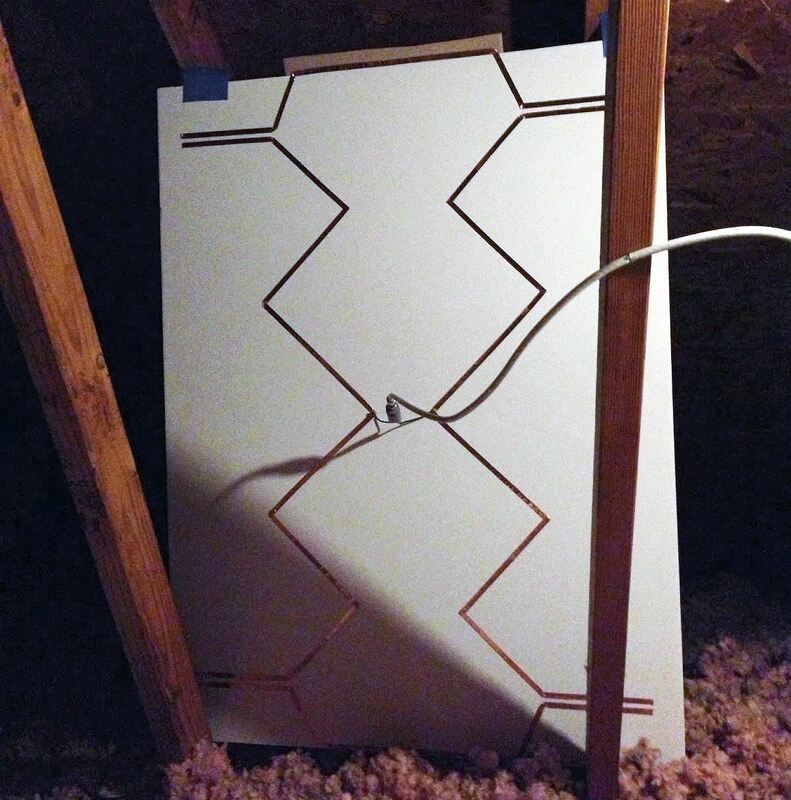 There are a number of tutorials using different materials, but one of the simplest comes from tech blogger John Biggs, using foam core board and copper tape for a light, inexpensive antenna that can be mounted indoors. Putting it together is easy. In addition to the foam core board and copper tape, you'll also need a really cheap balun transformer (which you can get at any electronics store), two wood screws (or solder) to attach it, and a coaxial cable to connect it to. 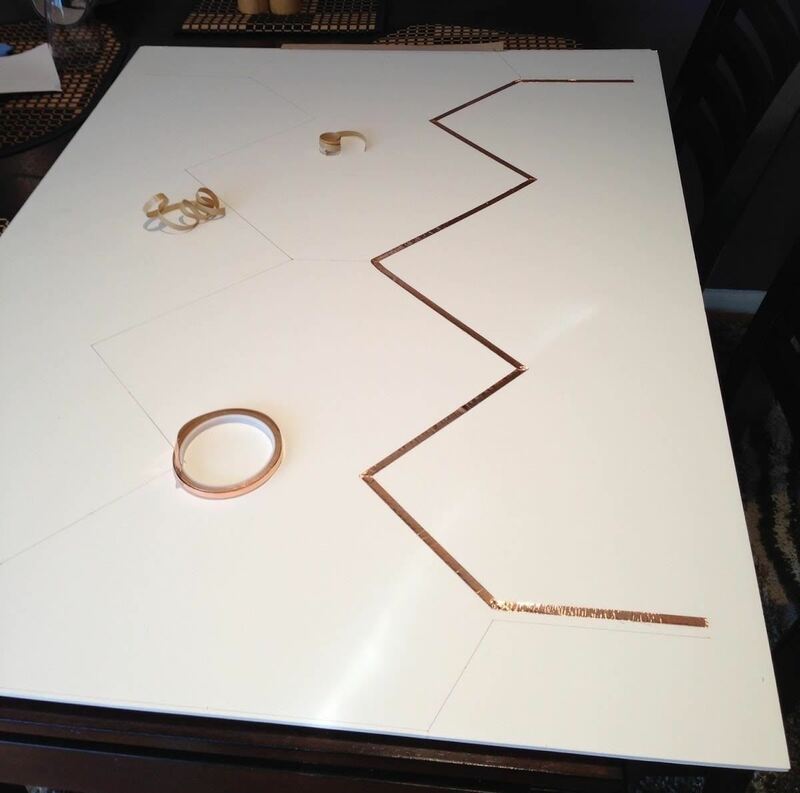 John created the diagram below and used a ruler and protractor to draw it on the board before laying down the tape. It's important to pay close attention to the measurements and be as precise as possible as your results will be determined by how accurate they are. When you start taping, it's important to fold the tape at each corner rather than cutting it, so each side is one continuous piece. 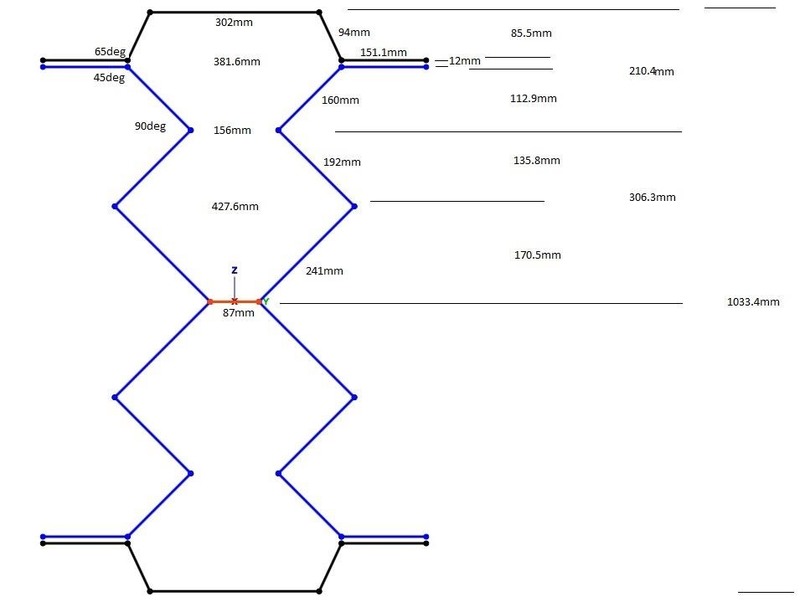 The top and bottom pieces (shown in black in the diagram) should be exactly 6mm from the sides (shown in blue). The gap in the center between the two sides (shown in red) should be 81mm after you've finished taping, and this is where the balun will be attached. You can either solder it on or use two wood screws to connect it to the copper tape. The antenna can be mounted pretty much anywhere, but you do need to make sure it's facing the right direction to pick up any stations. The model that John used (the GH0n) should be able to pick up digital HDTV channels that you're within range of, and works better with UHF or ultra high frequency channels (channels 14-51) than VHF or very high frequency (channels 2-13). To find out which stations your antenna will receive, you can use the FCC's online tool, or a different one like TV Fool, to locate stations in your area that broadcast for free. The tool will also tell you which direction they are broadcast from so you know how to position your antenna. Once you've got it positioned correctly, just plug in your coaxial cable and run a scan on your television to find channels. The settings are different for each brand, but you should be able to find an auto-scan option on the menu under Cable or Antenna. 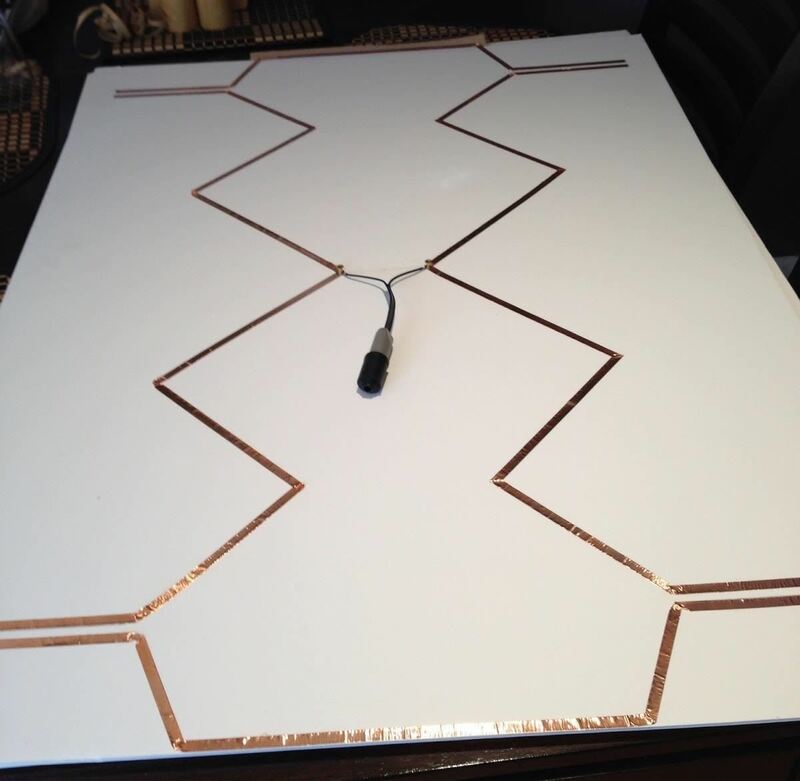 You can find more information and technical specs on the Gray-Hoverman antenna here, and more details on building your own over on John's blog. That's great, thanks for the write up. I was wondering can I build such antenna with aluminium foil rather than copper tape? If yes, would the reception gain be the same (i.e. negligible) if the design was the same? Save your money jack. Measure out a piece of 75 ohm coax wire to 42 inches and cut it. Form it into a loop with wild ends - like this 0 . You want the loop to be 6 inches diameter and the wild ends 12 inches long - like a dash - then an O and another dash-. Smash the corners flat with a hammer but use care not to cleave the wire through. Attach at the corners to a piece of PVC pipe one inch apart with sheet metal screws piercing right through the coax conductors. Before you tighten the screws also attach your co-ax downline - the shield to one corner and the center conductor to the other. Then tighten the screws. I like to put a round of electrical tape around the co-ax and the PVC to act as a strain relief. Since it's already 75 ohm impedance no 75-300 ohm transformer is needed. The higher you mount it, the better your reception. You should get every HDTV signal for at least 50 miles in every direction with this. Mount it on a tall length of PVC pipe set loosely so you can turn it from the ground if you need to for DXing distant stations. Is seldom necessary the thing gets an amazing signal because all of it is impedance matched. Total cost ? Less than two dollars. Mast PVC pipe is extra. Thanks AL for the tips. I have two questions for you. Shall we keep the cox loop shielded? What is your opinion about the 8 shaped loop below? Any improvement idea? Yes keep it shielded and keep the vinyl coating intact. I found the dimensions by experimentation. I'm up to design number 217 and I'm still trying other designs. Edison only tried 100 filaments to perfect the light bulb, though. 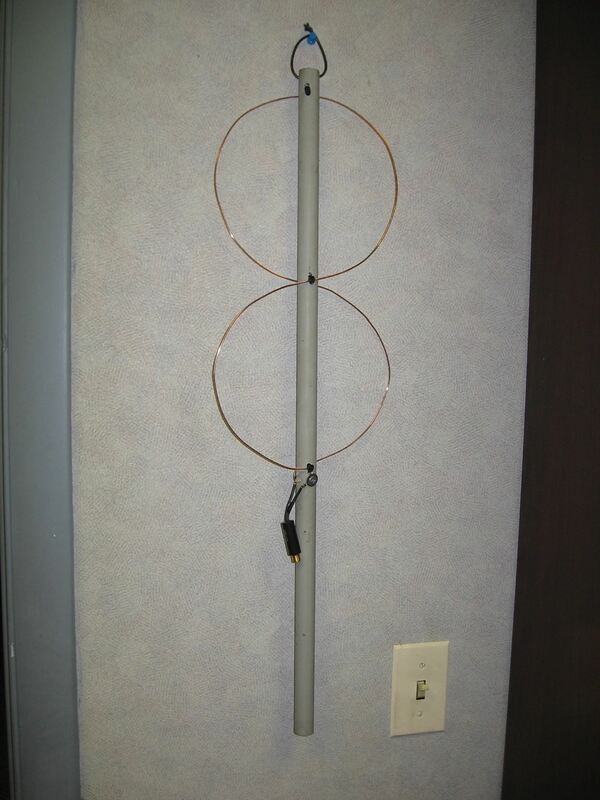 Your figure 8 antenna is an excellent design. I've tried dual-loop designs but some of them created resonances and blocked a few channels. Maybe mount your stick horizontally and separate the two loops then point your stick at the better stations. You will have to experiment with the distances between the loops. I also found the greater the diameter of the wire, the greater the bandwidth. For reasons I can't explain when the bare copper wire tarnishes the reception cuts by half. Hi Al, do you have any pictures of this setup? It looks like your post included pics, but I'm not seeing any. Thanks! Where did you base your calculation for this antenna? Can you give us your complete solution? Thanks in advance. I need to know if the design can be resized into the size of standard backcase of a smartphone, will it help to strengthen the signal reception?